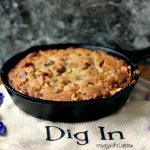 There is nothing quite like a skillet cookie, this Chocolate Peanut Butter version is a crowd pleaser. 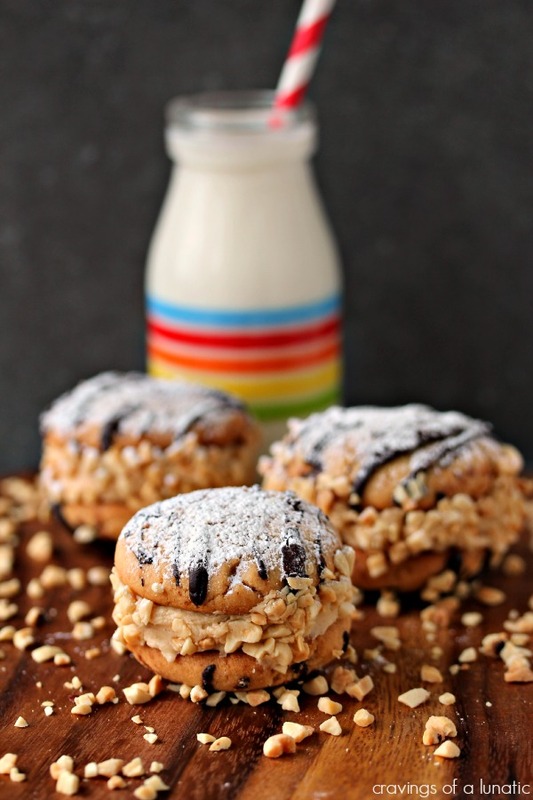 Incredibly easy to make, whip one up today! Hello my fellow Chocolate Fanatics. 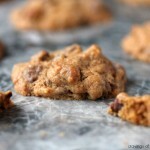 I’m hitting you with another fabulous cookie contribution for Food Fanatic. 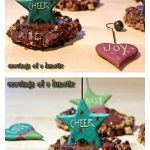 I happen to be their Chocolate Fanatic, which I have to admit is a pretty cool job. 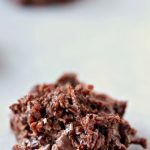 I get to play with chocolate recipes, for a living. My job is sort of rad. Not going to lie. 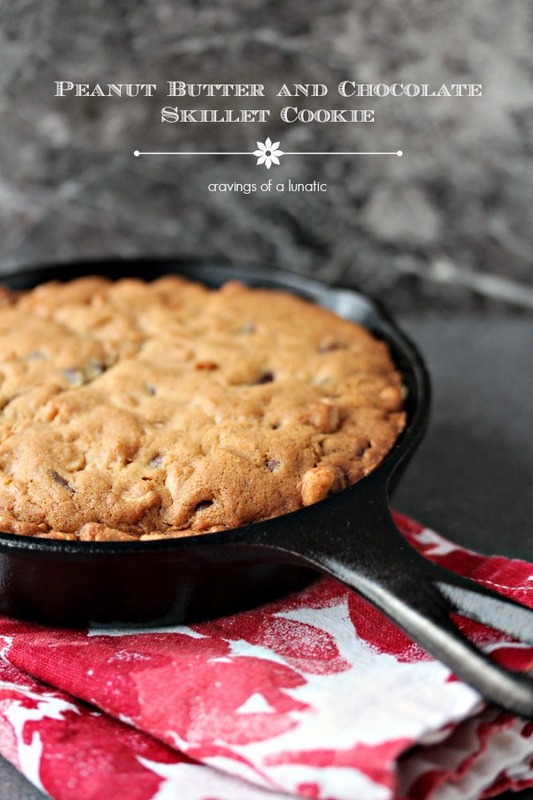 This Peanut Butter and Chocolate Skillet Cookie is something I made quite some time ago. I was on a skillet cookie kick. 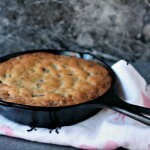 I made this Double Chocolate Chip Skillet Cookie for Cookie Week. 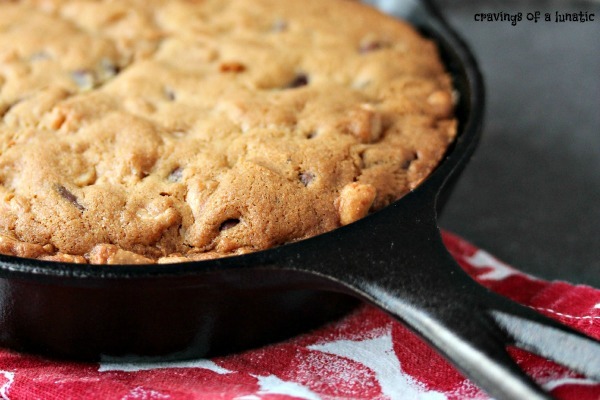 Plus I made this Chocolate and Hazelnut Skillet Cookie for Cookie Week as well. I got a little carried away with my cute little skillets. I picked up these little cast iron skillets on a business trip. I was travelling for a conference and happened upon them in a store we don’t have in Canada. So I picked up a whole whack of them. I figure they are super cute, so you can never have enough. Right? I know. It’s so silly but it’s how I roll. The more the better. This is a motto that gets me into a lot of trouble in life. I just have this all or nothing kind of personality. I cannot help myself. 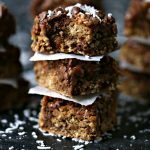 If a little chocolate is good then a TON of chocolate is better. 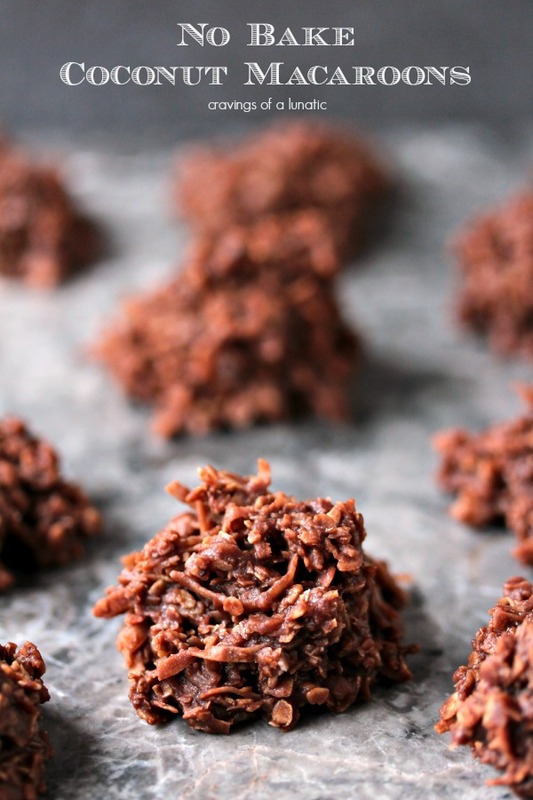 If making skillet cookies is good, well, let’s make skillet cookies every single day. All the live long day. I do this with pretty much everything in life. It drives my family a little crazy. I went on a furniture moving craze not long ago. It lasted for months. Every single day they would come home and the living room furniture would be somewhere different. I think even the pets are losing their patience with it. I swear I saw them taking bets on how long the furniture placement would last the last time I moved things around. I swear I saw $20 bills being passed about. One thing that remains consistent in my life is chocolate. It is never a passing fad. I never lose interest in it. I will never get tired of it. It’s one of my biggest passions in life. Chocolate rules my world. The more the better. Wow! 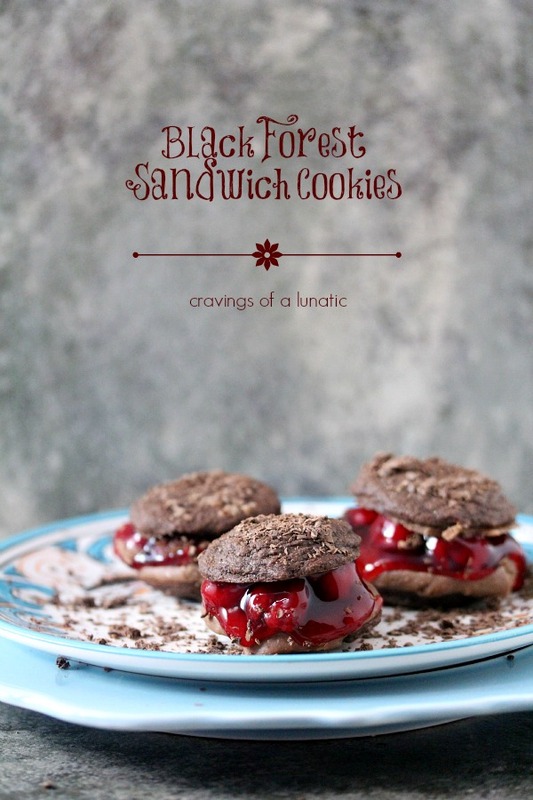 This looks terrific! Looks like it has loads of flavor, and the presentation is so much fun. Since it’s a “cookie” I assume a serving is one of these? 🙂 I’m taking off the rest of the year, so I want to wish you Merry Christmas and Happy New Years! 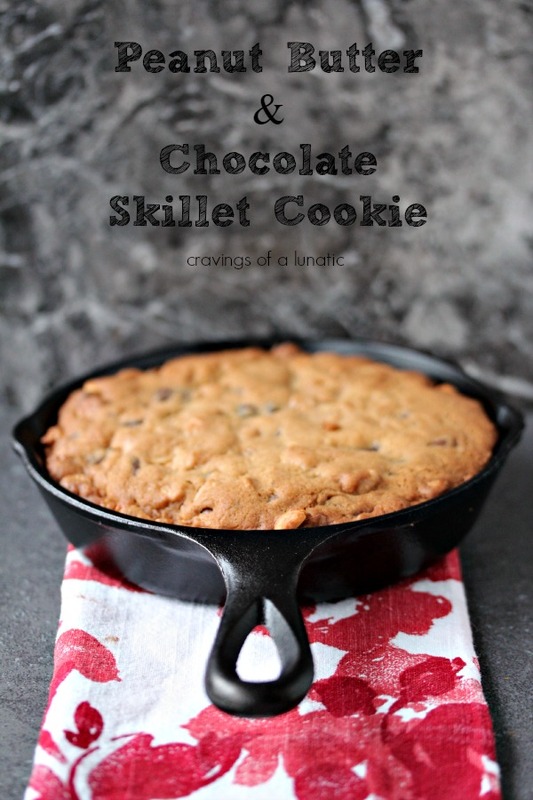 mmmmmmmmm skillet cookies are so PERFECT and I love that this one is PEANUT BUTTTERRR and chocolate!